A memorial service (Greek: μνημόσυνον, mnemósynon, "memorial"; Slavonic: панихида, panikhída, from Greek παννυχίς, pannychis, "vigil"; Romanian: parastas and Serbian парастос, parastos, from Greek παράστασις, parastas) is a liturgical solemn service for the repose of the departed in the Eastern Orthodox Church and those Eastern Catholic Churches, which follow the Byzantine Rite. Golgotha (Crucifixion icon), Orthodox cathedral in Vilnius. The lity tray (memorial stand) is at lower right, where the memorial services are celebrated. The stand has holders for the faithful to place candles. If the service is for an individual, it is often held at the deceased's graveside. If it is a general commemoration of all the departed, or if the individual's grave is not close by, the service is held in a church, in front of a special small, free-standing "memorial table", to which is attached an upright crucifix and with a candelabra for the faithful to put lighted candles. The deacon (or, if there is no deacon, the priest) swings the censer throughout almost the entire service, while all stand holding lighted candles. Near the end of the service, during the final troparia, all, either extinguish their candles, or place them in a candle holder by the memorial table. Each candle symbolizes the individual soul, which, as it were, each person holds in his own hand. The extinguishing (or giving up) of the candle, at the end of the service, symbolizes the fact that each person will have to surrender his soul, at the end of his life. 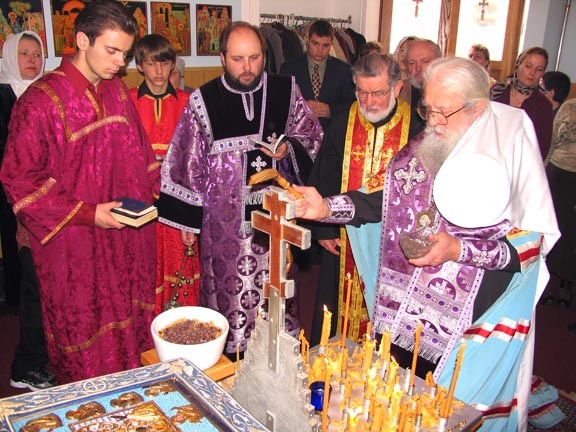 The service is composed of Psalms, ektenias (litanies), hymns and prayers. In its outline it follows the general order of Matins[note 2] and is, in effect, a truncated funeral service. 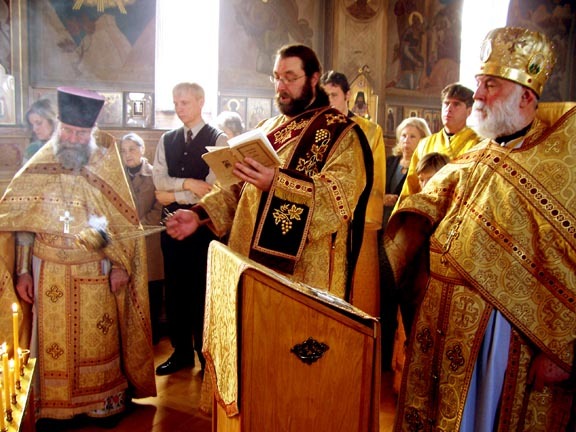 Some of the most notable portions of the service are the Kontakion of the Departed[note 3] and the final singing of "Memory Eternal" (Slavonic: Vyechnaya Pamyat). 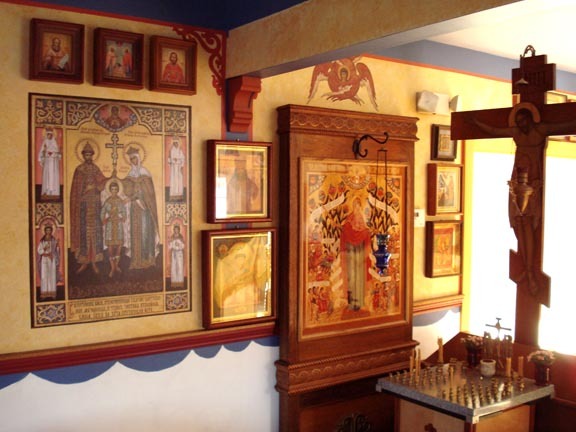 The memorial service is most frequently served at the end of the Divine Liturgy; however, it may also be served after Vespers, Matins, or as a separate service by itself. If the service is held separately, there are readings from the Pauline epistles and the Gospels, which are assigned by the day of the week; no readings, however, are assigned to Sunday because Sunday should emphasize the resurrection of Christ rather than the departed. 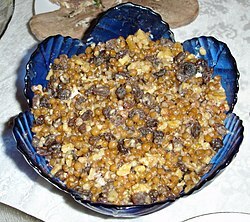 A dish of Koliva made from wheat and raisins, which is traditionally used during Orthodox memorial services. For the memorial service, koliva (a ritual food of boiled wheat) is often prepared and is placed in front of the memorial table or an icon of Christ. Afterwards, it is blessed by the priest, who sprinkles it with holy water. [note 4] The koliva is then taken to the refectory and is served to all those who attended the service. After an Orthodox Christian dies there are special "Prayers for the Departure of the Soul" that are said by the priest. Then the family or friends of the departed will wash and dress the body and it is placed in the casket after which a special expanded memorial service called the First Panikhida is celebrated, following which the reading of the Psalter[note 5] commences and continues uninterrupted until the funeral. In the Russian tradition, Demetrius Saturday (the Saturday closest to the feast of Saint Demetrius, October 26), commemorating the soldiers who fell in the Battle of Kulikovo (1380), under the leadership of St. Demetrius of the Don. the celebration of memorial services is forbidden from Holy Thursday through Bright Week and on all Sundays throughout the year. A very abbreviated form of the memorial service is called the Lity (or Liti or Litia), from the Greek λιτὴ τελετή, litē teletē, i.e. a plain ceremony, or λιτὸν μνημόσυνον, liton mnēmosynon, i.e. a plain mnemosynon; it consists only of the concluding portion of the regular memorial service. This is often celebrated in the narthex of the church on ordinary weekdays (i.e., when there is no higher-ranking feast day), especially during Great Lent. The Romanian 2016 film Sieranevada features a parastas in a Bucharest apartment with documentary precision. While the priest arrives, the family argues about several issues. The priest and his aides finally arrive, they sing and bless the home and the food that will be distributed as alms. A Wallachian ritual involving a suit is also a plot element. ^ From this comes the Greek name parastas which refers to standing all night in vigil, which in the early days was what literally took place. ^ Kontakion of the Departed: "With the saints give rest, O Christ, to the soul(s) of Thy servant(s), where there is neither sickness, nor sorrow, nor sighing, but life everlasting. ^ In calculating the number of days, the actual day of death is counted as the first day. According to St. Macarius the Great, the reason for these days is as follows: from the third day to the ninth day after death, the departed is soul is shown the mansions of Paradise (the funeral is normally performed on the third day); from the ninth to the fortieth days, the soul is shown the torments of hell; and on the fortieth day, the soul stands before the throne of God to undergo the Particular Judgement and is assigned the place where it will await the Second Coming. For this reason, the fortieth day is considered to be the most important. In some traditions, the semi-anniversary (six months) is also commemorated. ^ Saturday is generally a day dedicated to prayer for the departed, because Christ lay dead in the Tomb on a Saturday. In some monasteries and large churches, it is customary to serve a Panikhida on every Saturday, unless a major feast occurs on that day. ^ Because of the sacredness of the days, The celebration of memorial services is forbidden during Holy Week and Bright Week. ^ Cross, F. L. Cross; Livingstone, E. A., eds. (2005). The Oxford Dictionary of the Christian Church. Oxford University Press. Available (limitedly) online at the Oxford Reference. ^ For instance, the Panikhida does not have the chanting of "God is the Lord..." as the Moleben does; but instead uses, as at matins on Saturdays when the dead are remembered, the "Alleluia" of the Dead in place of "God is the Lord". ^ (in Romanian) Sieranevada. Flecăreala apoteotică a poporului nostru, Andrei Crăciun, 11 September 2016, Metropolis. This page was last edited on 29 June 2018, at 02:27 (UTC).